Its been a long time since we saw a very unique and awesome modification of the iPhone,specially when it comes to those special edition handsets from apple. But now you will be able to witness a full crystal Apple iPhone that is a follow up from the first 3 release of Goldgenie. Following the trio of gold Goldgenie iPhone 5s smartphones, the company has also unveiled a fourth one. 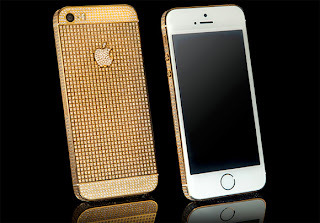 Named the iPhone 5s Supernova, the special edition of Apple's latest smartphone is encrusted with Swarovski Crystals on the back and sides giving it a whole lot of extra bling. Goldgenie has used 24 carat gold, but hasn't specified the amount of Swarovski Crystals embedded in each phone. In any case, it's not cheap - the 16GB iPhone 5s Supernova costs £3,837. The 32GB and 64GB models add up £100 and £200 to the price, respectively. The iPhone 5s Supernova comes in a luxury cherry oak box with the standard Apple accessories in it as well as a dock connector with USB port.